**Many thanks to NetGalley, Penguin Group/G.P. Putnam’s Sons, and the authors for the opportunity to read and review an ARC of this book. There are mysteries which men can only guess at, which age by age they may resolve only in part. Remember that episode of Friends when Rachel discovers Joey’s copy of The Shining in his freezer? If not, quick recap: Joey gets so scared while reading The Shining by Stephen King that he hides it in the freezer until he is brave enough to go back to it! That’s what I felt like resorting to while reading Dracul – only, I was reading it on my Kindle, and I don’t think electronics like freezers too much. This book was legitimately frightening in all the best ways! It doesn’t even start you off slowly, you’re immediately thrust into a dire situation with 21-year old Bram Stoker trying to last one night in the midst of sinister forces who prove to be unrelenting. Toward the end of the book, the action is so fast-paced and the enemies so numerous, you…well, you want to put the book in the freezer! He’s come for us, Bram. He wants me, but he wants you most of all. We are not that different, you and I, the blood of others thriving within our veins. Let’s just pause for a moment and appreciate the name, Dacre Stoker. 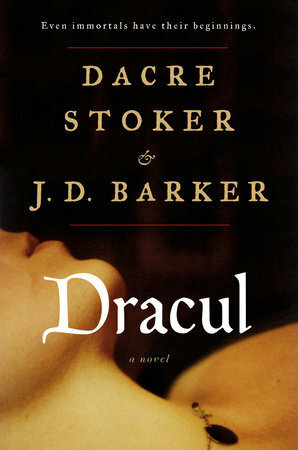 Who wouldn’t want to read a horror novel by a dude named Dacre Stoker? You kind of have to! The story is fiercely personal, told through the letters and journals of Bram Stoker, his sister and brother, and a colleague who helps them pursue the fearsome Count. It is a new story told about an ancient horror and I thirstily devoured every page! Dracul reads like a movie playing in my head with vivid imagery and precise (but not exhaustive) mood-setting. I recommend this book to fans of the original book Dracula and fans of all the original monsters that make us check under our beds (nope, I don’t still do that. Nu-unh. Well, hardly ever…). Even if you’ve only ever seen the movie, this book’s descriptive prose will instantly transport your imagination back to the 1800s with stuttering lanterns, rolling fog, and things that go bump in the night. Mu-hah-hah-hah! <– But trust me, it’s not hokey like that, not at all. Dracul releases October 2, 2018 – just in time for Halloween – so make sure you add this one your TBR!